Not long after birth, infants view people’s faces by relying on the outline of the face. Therefore, in principle, they won’t be able to tell who their mother is if she changes her hairstyle. (However, in reality, they are able to tell by relying on the smell and voice of the mother.) 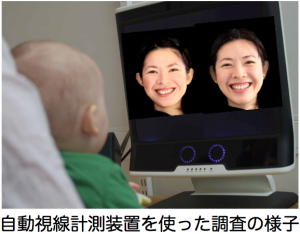 Babies start paying attention to the eyes and mouth around two months after birth, and they are able to tell their mother even if she changes her hairstyle. So how does the way a baby views faces change, in accordance with their development? Which part of the face do they look at when the other person is laughing, angry, or surprised? We will also look at the reaction toward different emotions that people display. How about reactions toward movements? Colors? Sounds? How one perceives moving objects and colors—and the attention given to sounds—also changes with development. We are developing tests that can easily measure the development of perception in a medical-examination setting.